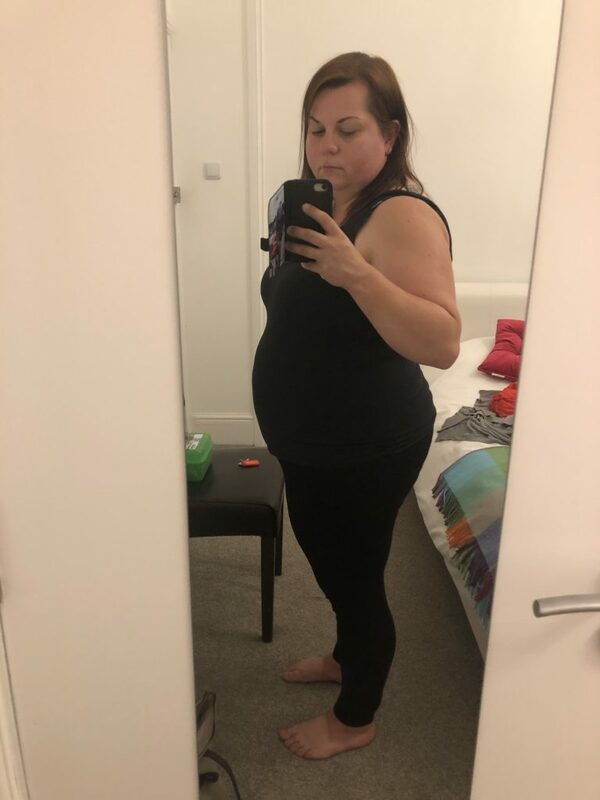 Yesterday I wrote about my reasons for going keto and I’m now on day one – I’ll update at the end of the week on how it’s going; however I wanted to write a little bit about meal planning and essentials. I’m not going to post links for the simple reason that there are so many sites and guides to keto on the internet; I’d suggest having a good look and doing your research prior to going for it so you know what to expect. I’m no expert – I’m just bluffing my way through it and sharing information and tips as I hear or learn them. So keto is basically low carb, high fat – the first thing I did was download My Fitness Pal so I can track my carbs, fat, and protein. You are supposed to stick to a ratio of 70% fat, 25% protein and 5% carbs. Your maximum daily total carbs should be 35g and ideally 25g and under; but everyone is different. Carbs are also labeled total carbs and net carbs – total carbs are, well, exactly that – the total amount of carbs. Net carbs can be worked out by taking away the fibre content of a food from the total carb value. I’ve calculated my macros(carbs, fat, and protein) based on 1800 calories a day; using a keto calculator and based on my BMR(basic metabolic rate). Your body switches to a fat-burning mode but you should still aim to stay within your calories. 3500 calories roughly equates to a pound of weight; therefore by eating 500 calories a day less than your body needs, you would, in theory, lose a pound a week. Tracking everything is known as strict keto; tracking carbs only is known as lazy keto. Water is vital – apparently, you should aim for 3 litres a day. I usually barely manage a litre – I’ll try my bestest, promise. 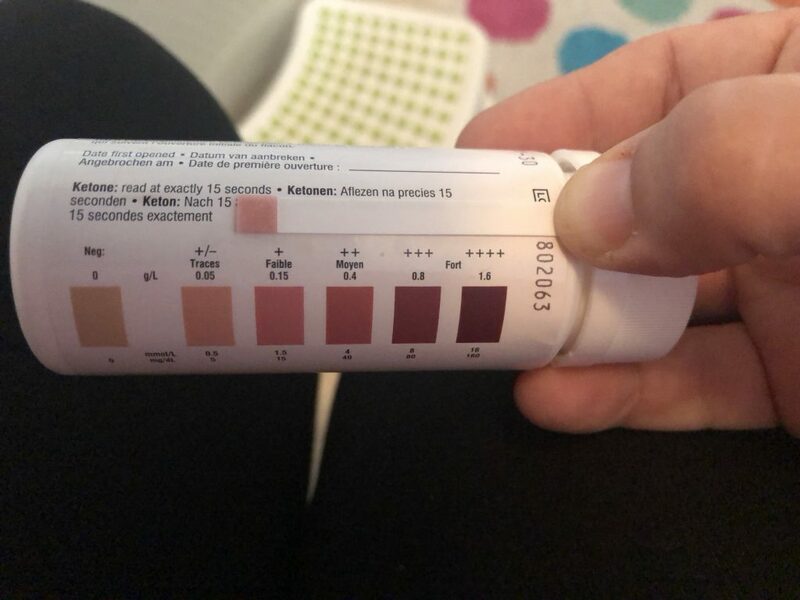 When your body goes into ketosis it can take a bit of a pounding – headaches, tiredness, the shits, bad mood, bad breath… it apparently does pass but the first few days can be tough. From my own research, I’ve fathomed that electrolytes are a must – I’ve gone for High 5 Zero tablets and a potassium and magnesium supplement. Apparently, this rough-as-arseholes feeling is known as ‘keto flu’ and goes after the first few days. 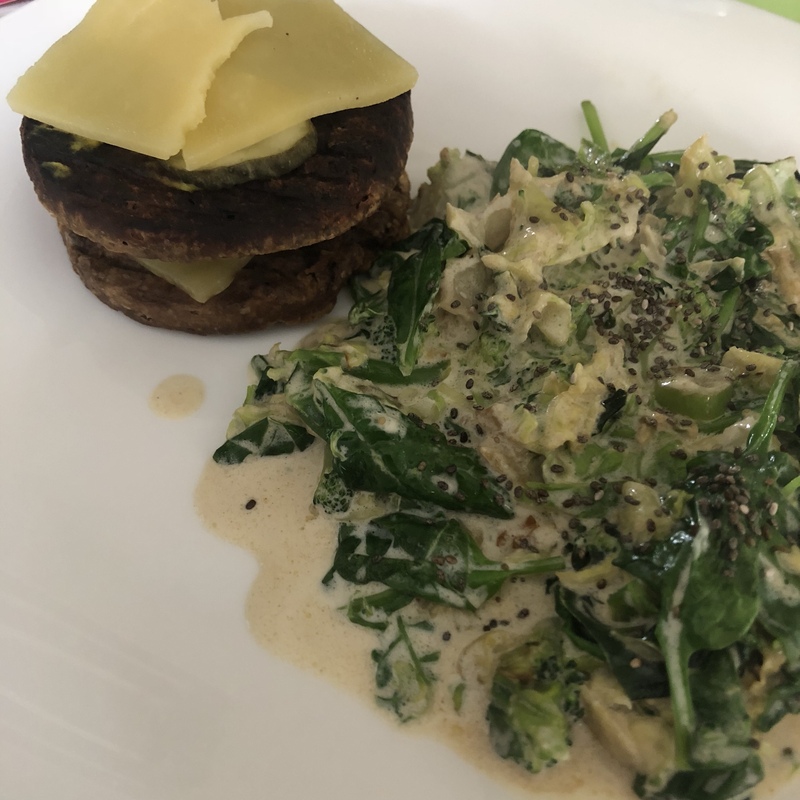 It wasn’t cheap, for one – hubs decided he wanted to give keto a go too, I’m veggie(well, pescatarian) and he eats meat so buying bits for both of us was a little pricey. I bought eggs, various cheeses, nuts, salad, spinach and other leafy greens, and oodles of cream. 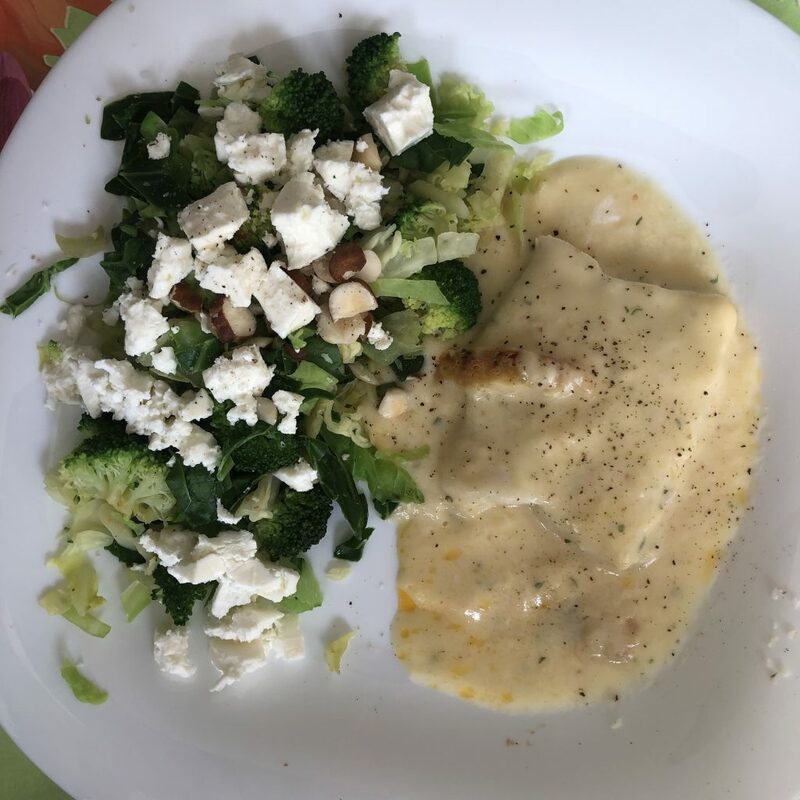 I’ve tried to keep it simple initially – one, to get used to keto, and two – I’m working every evening this week so I need to not fall off the wagon and get hungry. Breakfast: scrambled eggs with butter, avocado, spinach, mushrooms and a little cheese. Dinner: Feta and seed salad with egg mayonnaise. Snacks: I’ve so far(two days in) not really snacked, but a few brazil nuts and a slice of cheese seem to be enough. Drinks: High 5 Zero tablets x2 – one in the morning, one in the evening. Tea – decaf tea with a pinch of stevia and cream. Start – front view. Goodbye chins! I have bought some Ketostix – they are test strips you dip in your wee to see if you are in ketosis. They cost around £5 and I bought mine from eBay. I’ve also taken photos so I can see how I’m progressing and I’ll be taking measurements too. 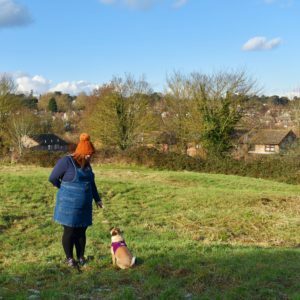 Headache tablets are a must – I’ve suffered dreadful headaches these first two days. I’ve bought a couple of low carb books for meal inspiration; you can usually find a random selection in bookshops. 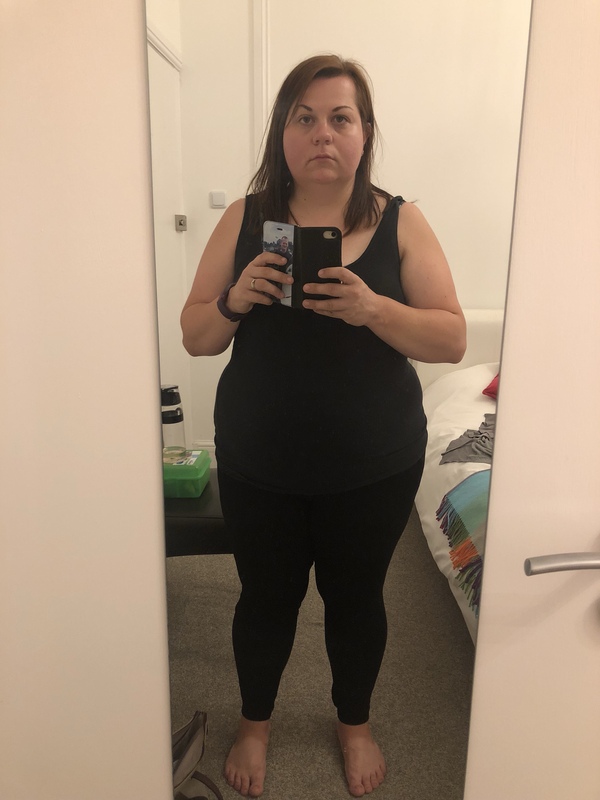 So, that’s me – week one of Keto – any tips or tricks would be greatly received and as always I’ll keep you posted on my progress. I’m updating daily over on my Instagram stories – you can check them out here.